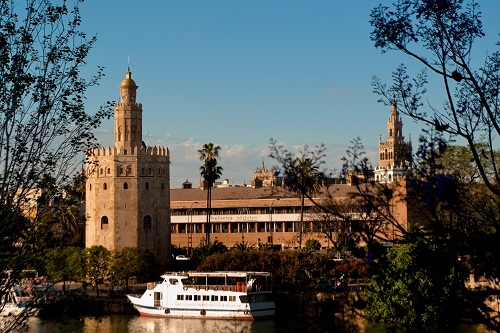 Cruise on the River Guadalquivir knowing the beautiful buildings and bridges that are located on its shores, including: Ticket. Pick up point: Muelle Torre del Oro. Pick up time: 10:00 am - 8:00 pm. 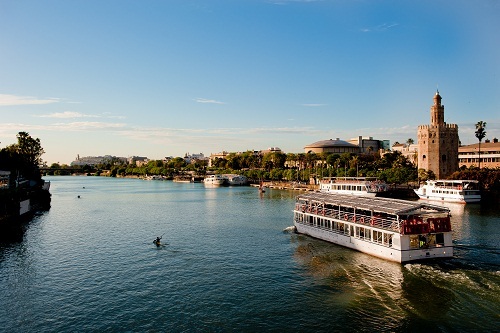 At the ‘muelle de la Sal’ (Salt Wharf), just like the sailors of old, we will take a beautiful boat trip which will bring us past the wonderful buildings, Triana district, where you will see San Jorge’s Castle, built in the 10th Century. 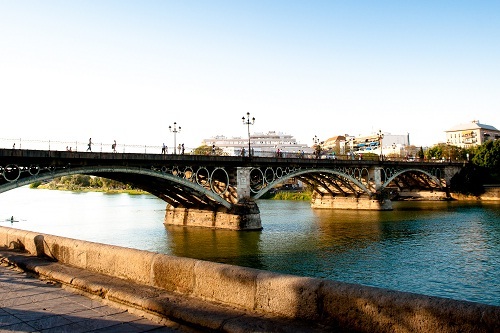 and bridges along the banks of the River Guadalquivir across the famous Isabel II Bridge, Monastery de Santa María de las Cuevas and Monastery de la Cartuja, where the famous Christopher Columbus for three years forged his journey into the unknown, the New World. Return Point & Time: Where the cruise berth, same point of departure. Guide languages: Spanish, English, French, Portuguese, German & Italian.